Image: “Let That Be Your Last Battlefield,” proof of the futility of removing politics from Star Trek. 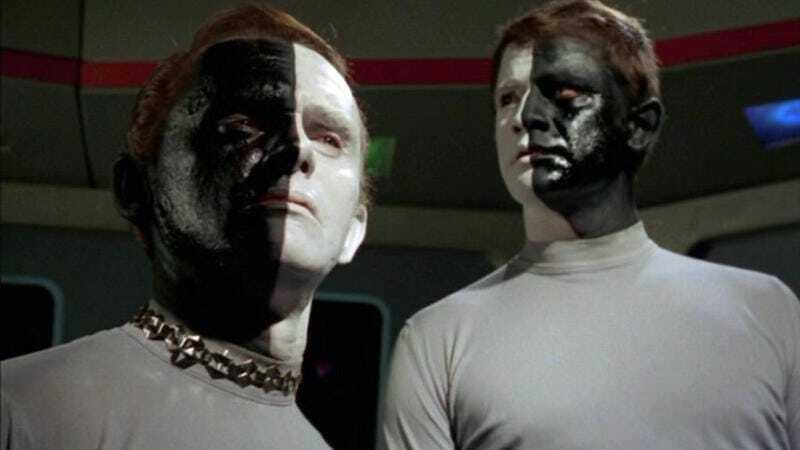 In one of the least surprising turn of events in history, the people who worked on Star Trek--a show which envisions a future Earth without sexism, racism, religion, and even money--find the thought of a Trump presidency abhorrent. More surprisingly, they all want to be clear that a vote for a third party is a vote for Trump. We have heard people say they will vote Green or Libertarian or not at all because the two major candidates are equally flawed. That is both illogical and inaccurate. Either Secretary Clinton or Mr. Trump will occupy the White House. One is an amateur with a contemptuous ignorance of national laws and international realities, while the other has devoted her life to public service, and has deep and valuable experience with the proven ability to work with Congress to pass desperately needed legislation. If, as some say, the government is broken, a protest vote will not fix it. If anyone is going to be affected by this post--and it would be great if this managed to be persuasive--it’s going to be people who think of Hillary Clinton as too moderate for them. Most of the Trek-affiliated people you can name has endorsed this letter. A small sampling includes J.J. Abrams, Scott Bakula, Ira Steven Behr, LeVar Burton, John Cho, Peter David, Jonathan Frakes, Bryan Fuller, Walter Koenig, Gates McFadden, Kate Mulgrew, Simon Pegg, Chris Pine, Zachary Quinto, Andrew Robinson, Brent Spiner, Marina Sirtis, and George Takei. Notably missing from the list are William Shatner and Patrick Stewart.